Barbados' Andre 'DJ Puffy' Parris has been crowned the 2016 Red Bull Thre3style World DJ Champion. Caribbean people got a scare when Barbados’ Dj Puffy did not appear in position number three but they were ready when he ‘up de ting’ in fourth position. Earlier a commenter on the live feed had said that Andre ‘Dj Puffy’ Parris would hit the stage third, so when he did not walk out at that moment, the text box lit up with ‘Where is Puffy?’, ‘What happen to Puffy?’, ‘I’m confused’, but Loop contacted his management and the error was clarified. Leading off the finals, which comprised the four winners from the four nights of qualifiers plus one wild card, was JFB from the UK. He dropped, ‘Let’s get ready to rumble’ at 7:43pm when he took to the set. He also threw in the Fresh Prince of Bel-Air theme song. Each disc jock had 15 minutes to impress the crowd and judges. Second was Trapment from Canada and he stunned the crowd when he climaxed with Whitney Houston’s ‘I will always love you’. Beast Mode from Down Under, Australia, took to the stage with no head phones and there was technical mishap when a head shell with cartridge and stylus also known as the needle, had to replaced on the right turn table during his set. DJ Jazzy Jeff quickly placed a replacement and the show went on without Beast Mode pausing in his set. As soon as the 25-year-old Bajan walked out onto the stage again the text box went crazy with supporters tweeting ‘PUFFYYYYYYYY’. Other commenters were begging the Barbadians to stop spamming the text box in fear that it may crash. Puffy played way more than three styles as is his style. It was all fun and games as he played until he dropped his Rupee ‘Tempted to Touch’ soca plate. Then if that was not enough, he dropped a King Bubba ‘Mash up’ plate and his mix of Amy Winehouse’s ‘Rehab’, ‘They try to make me go to rehab and I said…” then he slid in ‘No no no’ by Dawn Penn and DJ Numark flew out his seat and nearly dropped his clipboard while Dj Jazzy Jeff rocked back in his seat simultaneously. Finishing the Finals was You-Ki from Japan and he was one of the only disc jocks to include Young M.A.’s ‘Ooouuu’ in his set. He too wore no headphones. Then the judges went to deliberate. The finalists are judged for their creativity, originality, track selection and more. 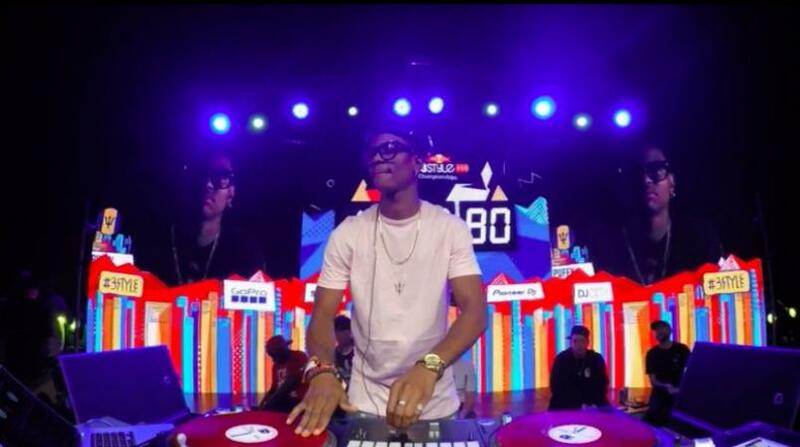 About half an hour later, DJ Puffy was announced the 2016 Red Bull Thre3style World Champion for 2016.